TUESDAY UPDATE: Clear Channel's launch of "Rush Radio 1200" in Boston is coming faster than expected. As of next Monday, Limbaugh is gone from longtime affiliate WRKO (680 Boston), replaced by a local show hosted by political consultant Charley Manning - and over at rushradio1200.com, there's now a website up, complete with a "Rush Radio 1200 WXKS" logo and Limbaugh himself shown as "on air." Meanwhile at WBZ, they're mourning Don Kent, the veteran weatherman who died Monday night at his New Hampshire home. Kent came to WBZ-TV in 1950, and remained an icon of New England TV weather for three decades. He was 92. *That mythical "wheel of formats" was spinning fast in NEW YORK's capital city last week, at least where Albany Broadcasting's cluster was concerned. 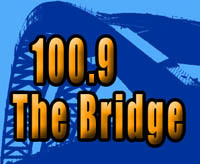 One format change was expected: on Wednesday, WKLI (100.9 Albany) broke out of the simulcast with WROW (590 Albany), which has inherited WKLI's former "Magic" standards/soft AC format, becoming "The Bridge" with an adult hits format. There's no live talent on "The Bridge" just yet, but Albany Broadcasting says the plan is to add an airstaff down the road. 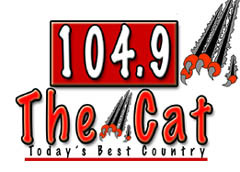 The surprise came on Friday, when sister station WZMR (104.9 Altamont) ditched its "Edge" modern rock format to go country as "The Cat." This is the second time Albany's had country on 104.9; from January 2005 until February 2006, WZMR simulcasted country "Froggy" WFFG from up in the Glens Falls market before launching "The Edge." It's not hard to surmise what Albany Broadcasting has in mind here: the cash cow in their cluster is AC powerhouse WYJB (95.5 Albany), which routinely battles with Regent's country behemoth WGNA-FM (107.7 Albany) for the top of the ratings pile. Will bumping the older-skewing "Magic" format to AM pull some of its FM audience over to B95 - and might "The Cat" on 104.9 then shave just a bit of the country audience off WGNA? It's possible...but we've seen this strategy attempted without much success in other markets in the past, too. As for the talk format that used to be on WROW, one of its personalities has landed across town: Premiere's Glenn Beck show starts today on Clear Channel's WGY (810 Schenectady), where it displaces local talker Al Roney from the 9 AM-noon timeslot. *We can add one more syndicated show to the lineup at Citadel's new "Big Talker" in Syracuse (WLTI 105.9) as it prepares for a debut later this week: Doug McIntyre's "Red Eye Radio," based at Citadel's KABC (790) in Los Angeles, will occupy the overnight hours there. As we noted in a midweek update to our last column, the rest of the lineup at 105.9 includes Bob & Tom in morning drive, local talker Gary Nolan in the afternoon and an eclectic mix of syndicated talkers including Stephanie Miller from the left, Michael Smerconish and Dave Ramsey from somewhere in the center and Mark Levin on the right. Down the hall at Citadel's lone Syracuse AM outlet, new calls are in place to go along with the new "Score" slogan. The former WNSS (1260 Syracuse) is now WSKO, a callsign Citadel last used in Providence before it pulled the plug on "Score" sports-talk there a couple of years back. The new WSKO will lead off its day with Don Imus, using Sporting News Radio the rest of the day until local sports talker Brent Axe hits the air at 2 PM weekdays. Friday's the big day for the Syracuse sports affiliation shuffle, of course, when Galaxy picks up ESPN from Citadel, launching "ESPN 97.7 and 1200" on WTLA (1200 North Syracuse), WSGO (1440 Oswego) and their translators at 97.7 and 100.1, as well as ESPN Deportes on WSCP (1070 Sandy Creek). The new ESPN outlets will also have Syracuse University sports, and what better time to have that set of basketball rights? Here in Rochester, Brody has left the building at Stephens Media, where he was production director and midday jock for WZNE (94.1 Brighton); he's following his wife, former WPXY jock Amanda Valentine, to Denver, where she's now working for Entercom's KALC (Alice 105.9). There's a new signal on the air in the Jamestown area: the Louisiana-based SONLIFE religious network put WYRR (88.9 Lakewood) on the air last week. And on TV, there's a new subchannel coming to several of Sinclair's stations: the company has signed a carriage deal with "THECOOLTV," a new music-video network. It'll air on WUHF (31.2) in Rochester, WSYT (68.2) in Syracuse and either WUTV (29.2) or WNYO (49.2) in Buffalo beginning in a few weeks, as well as on WGME (13.2) in Portland, Maine. *New York City's "Franken-FM" is getting a new format this week, for at least part of the day: WNYZ-LP (Channel 6, aka 87.7 FM) is being leased out to a Korean-language programmer from 5 AM until 8 PM daily. That means the "Indie Darkroom" modern rock that's been airing on WNYZ since the demise of the "Party FM" simulcast last month will be heard only in the evening and overnight hours. WWRL (1600 New York) has filled the timeslots that were left vacant when Air America went belly-up recently, and it's sticking with progressive talk: Thom Hartmann is now being heard weekdays from 3-6 PM, followed by Mark Riley from 6-8 PM. CBS Radio's sports giant WFAN (660 New York) is already being heard on FM HD subchannels at several CBS stations in Florida, and now it's added a Washington, DC simulcast. DCRTV.com reports that WJFK-FM (106.7 Manassas VA) is now running four FM HD sports streams: its own local programming on HD-1, Baltimore's WJZ-FM on HD-2, New York's WFAN on HD-3 and Philadelphia's WIP (610) on, yes, HD-4. There's some sad news from public broadcaster WNYC: producer/engineer Dave Nolan died of a heart attack Friday, just a week before he was to have joined the station full-time as a senior archivist, working alongside Andy Lanset in WNYC's remarkable archives. Nolan had worked with WNYC for a quarter of a century on an occasional basis while working in a variety of audio engineering roles around the city and co-hosting at WBAI (99.5). Nolan was just 48. *The weather was the big story over the weekend in NEW HAMPSHIRE, especially at Saga's cluster in Manchester, where high winds literally ripped the roof off the Commercial Street studios of WZID (95.7), WMLL (96.5) and WFEA (1370) early Friday morning. With several inches of water in every studio, WZID reportedly relocated to a conference room down the street at the WMUR-TV studios, staying on the air helping to provide emergency information as some 300,000 New Englanders suffered without power or heat. The power outages knocked some other stations off the air around the Granite State, too, at least temporarily; thankfully, there's been no word of any other facility damage so far in New Hampshire. On the seacoast, Clear Channel is shuffling its morning lineup. The "Matty in the Morning" simulcast from Boston's WXKS-FM (Kiss 108) is relocating from York Center, Maine-licensed WSKX (Kiss 95.3) to WERZ (107.1 Exeter), where it replaces the syndicated "Bob & Sheri." Will Clear Channel be using more of its "Premium Choice" in-house syndication on 95.3? *MAINE's public radio network felt the brunt of the weekend storm along the coast, as high winds damaged the antenna of WMEP (90.5 Camden) atop Ragged Mountain, silencing the station. The combination of damage there and the destruction of power lines leading up the hill may keep WMEP off the air for several weeks. MPBN is urging listeners to tune to two of its other signals, WMEA (90.1 Portland) and WMEH (90.9 Bangor), which provide fringe coverage of Camden. *Our MASSACHUSETTS news this week begins with the ouster of a PD: Frank Mitchell is gone from WPLM-FM (99.1 Plymouth) after not quite two years as programmer. Mitchell was also the morning host at "Easy 99.1"; no replacement has yet been named. A veteran New York jock has turned up on the Boston noncommercial dial. Meg Griffin made a name for herself at the old WNEW-FM and WXRK in the eighties and nineties, later spending time at VH1 and most recently at Sirius Satellite Radio's "Loft" channel. Griffin has been living in the Boston area for the last few years, and now she's doing evenings on WUMB-FM (91.9 Boston), where her 7-10 PM "Music Mix with Meg" displaces the evening airing of "World Cafe" to 10-midnight. Out west, Rob Cressman just got a promotion at Saga's Pioneer Valley cluster, where he was already programming WLZX (99.3 Northampton). Now he's "director of programming" for both WLZX and sister station WAQY (102.1 Springfield), where he replaces Dave Cooper, who'd been PD there for not quite three years. In the Berkshires, talk host Sherman Baldwin is off the air at WBRK (1340 Pittsfield), where he was leasing time for the afternoon "Talk Berkshires" show for the past year. Baldwin, who'd earlier been heard on Albany's WROW, tells the Berkshire Eagle he was booted from WBRK because his program raised allegations of sexual misconduct by a former Berkshire County sheriff - and he says WBRK offered to let him keep doing the show only if it stopped addressing local news topics. After twice scheduling news conferences to further address the issue, Baldwin cancelled on an attorney's advice. WBRK owner Chip Hodgkins told the Eagle that "there have been issues" in recent months, and that Baldwin "decided to leave" and was not terminated. On TV, Boston's last analog signal is gone: WFXZ-CA, which was carrying Azteca America Spanish-language programming on channel 24, has gone digital on channel 25, transmitting a 5 kW signal from the FM128 tower in Newton. *The morning is starting a little earlier at one CONNECTICUT TV station. NBC's WVIT (Channel 30) moves the start of its morning news ahead to 4:30 AM beginning today, following a growing trend around the country for even earlier morning newscasts. 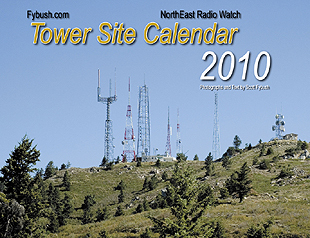 IT'S 2010 - DO YOU HAVE YOUR NEW CALENDAR YET? We're selling them at a pretty good pace this year, which means a sellout is likely. *In PENNSYLVANIA, there are new calls coming to Bold Gold's soon-to-launch talker in the Wilkes-Barre/Scranton market: WLNP (94.3 Carbondale) is becoming WTRW. In Lancaster, Franklin and Marshall College is taking WFNM (89.1) off the air for six months. F&M tells the FCC that renovations to the Old Main Building, where WFNM's transmitter is located, will force the station to be silent from March 15 until about September 15. The new Catholic station in Oil City has call letters: WQHE (88.3) will be licensed to the Oil City Columbian Home Building Association, which is tied in to the Knights of Columbus. Down the road in Greenville, WGRP (940) and WEXC (107.1) are among the Beacon Broadcasting stations that are now up for sale following the death of Beacon owner Harold Glunt. Pittsburgh broker Ray Rosenblum is handling the sale of the cluster, which also includes WLOA (1470 Farrell) and two signals on the Ohio side of the state line. In Waynesburg, WKVE (103.1) is telling listeners to make the shift over to its simulcasts on WANB (1210) and its FM translator on 105.1...and that means the move of WKVE to Mount Pleasant is coming soon, bringing a new FM signal to Greene and Fayette counties with fringe coverage of Pittsburgh's southern suburbs. Owner Bob Stevens was testing the new Mount Pleasant signal a couple of weeks ago with storm information. Two obituaries from the Keystone State this week: Marlowe Froke was a professor of journalism at Penn State in 1964 when he put WPSX-TV (channel 3, now WPSU-TV) on the air. A decade later, Froke also established a statewide public-affairs cable channel, initially known as "Pennarama" and now as PCN. Froke retired from Penn State in 1992 and later served as president of the Cable Center in Denver, which he had helped to launch as a museum of cable TV at Penn State. Earlier in his career, Froke had served as news director at Chicago's WGN radio and TV. Froke died Feb. 23 at Mount Nittany Medical Center in State College; he was 82. In Pittsburgh, they're mourning newsman Otto "Mark" Schaefer, who came to WIIC-TV (Channel 11, now WPXI) in 1957 when the station went on the air, then moved over to KQV (1410) in 1966. Schaefer remained part of KQV into the station's transition to all-news, retiring in the early nineties. He died Friday (Feb. 26) at 84. Speaking of "WIIC," the low-power TV station that now bears those calls in Pittsburgh got slapped by the FCC last week for changing channels without permission. WIIC-LP was authorized to use channel 29, but when FCC agents inspected the station in December 2007, they found that it was using channel 32 - and had been doing so since at least the previous April. Owner Abacus Television didn't deny the violation, but it asked the FCC for a break from the proposed $4,000 fine. The FCC says Abacus failed to submit financial documentation to justify its claim of a hardship, but it did reduce the fine for previous compliance, so Abacus now owes $3,200. *There's a new HD Radio multicast in NEW JERSEY: Brookdale Community College's WBJB (90.5 Lincroft) lit up "Altrok" on 90.5-HD2 last week, along with "Brookdale Student Radio" on 90.5-HD3. Both services are streaming as well, and probably reaching more listeners that way than via the HD subchannels, at least for now. Down the shore at Atlantic Broadcasting, we're hearing Brett DeNafo is out as PD, though he retains an ownership interest in the group. *One of CANADA's most popular morning radio hosts says farewell today. Andy Barrie's final "Metro Morning" will air from 5:30 until 8:30 on CBLA (99.1 Toronto), followed by a finale in front of a live audience in the CBC Broadcast Centre, in which new "Metro Morning" host Matt Galloway will interview Barrie as the morning baton is handed over. Over at Oshawa's "Rock 94.9" (CKGE), David Marsden is moving his "Marsden Theatre" shows to Saturday and Sunday nights. The legendary Toronto PD had been broadcasting on Thursday and Friday nights at 94.9. In Montreal, CJAD (800) is picking up "Coast to Coast AM." The show had aired on the now-defunct CINW (940) in its days as a news-talk outlet. In a decade and a half of doing this column, we've shied away from repeating rumors and spreading gossip. But sometimes the drumbeat is so loud, and so clear, that it's hard to ignore - and that's the case, this week, with CBS Radio's NEW YORK cluster. Even as salespeople for WXRK (92.3 New York) settle in as the first tenants of the cluster's new home downtown at 345 Hudson Street, well-placed sources tell NERW that managers are looking for a new request line number that ends with the letters "H-I-T-S." That, needless to say, doesn't fit the rock format of "K-Rock" or the AC format of its eventual neighbor at Hudson Street, "Fresh" WWFS (102.7). But it does track with the big flip out in Los Angeles last week that transformed FM talker KLSX (97.1) into top-40 "AMP Radio." Despite rumors that have suggested "AMP" clones showing up everywhere from Boston to San Francisco, we're hearing that the eventual flip in New York - whether at WWFS or WXRK - won't carry the "AMP" branding, which will apparently remain unique to L.A. So which signal will end up flipping in New York, and when? That remains a well-guarded secret for now, though with the contract for morning men Opie & Anthony just a couple of months from expiration, it certainly would seem that WXRK is more obviously poised for a flip than WWFS, which has been surprisingly successful with its "Fresh" format after many years of instability and repeated format flips as WNEW. We now know the outcome of this morning's big meeting in Syracuse - and it ends up being the opposite of what we'd surmised - Barrington Broadcasting's NBC affiliate, WSTM (Channel 3), is taking over operations of Granite's CBS affiliate, WTVH (Channel 5), under a shared-services agreement. There was no noon newscast on WTVH, and it appears much of that station's staff may be out as operations of the CBS station move two doors down to WSTM's studios. We'll have much more on this developing story in next week's NERW. The news out of MAINE is all about call changes: WKCG (101.3 Augusta) has become WVQM, to match its news-talk simulcast with WVOM (103.9 Howland) in the Bangor market. Meanwhile, Bangor's WABI (910) sheds the calls it's had for more than eight decades - it's now WAEI, matching its WEEI-simulcast FM sister, WAEI-FM (97.1 Bangor). The WABI calls live on over at WABI-TV (Channel 5). If the measure of a man is in the lives he touched, then the late David Brudnoy lived a full life indeed. On Sunday afternoon, Brudnoy's friends - and even his casual listeners on WBZ (1030) counted themselves as friends - lined up around the block to fill the Cutler Majestic Theater for a tribute to one of the most eclectic personalities ever to grace a microphone. For two and a half hours, the crowd - including Boston mayor Tom Menino and other local notables - heard from friends and family across the many facets of Brudnoy's life. "He did all things all the way," said Peter Meade, Brudnoy's close friend and former WBZ host, as he introduced the speakers. To judge from the stories Brudnoy's family shared, that was a trait that distinguished David as far back as his childhood in Minnesota. His cousin Rachel Brudnoy shared the tale of how a 12 year old Brudnoy worked the phones and persuaded a Minneapolis hotel, a car dealer and a luxury restaurant to prepare for the state visit of a fictional "Grand Emir of Aden." Brudnoy's doctors spoke of the incredible strength that brought him back to life after the 1994 illness that left him all but dead. Several of his students at Boston University spoke of the energy, enthusiasm and wit he brought to the classroom, including his attack on the use of the word "like" in students' speech. In the last years of his life, Brudnoy was adopted by the Emerson College chapter of the Phi Alpha Tau fraternity, whose members were in turn adopted by "Brother Bruds," who brought them into the whirl of what student Roman Sturgis called "the Brudnoy-centric universe." Brudnoy's former producer, Kevin Myron, shared the nickname that the erudite, scholarly Brudnoy bestowed on him ("Yo"), saying Brudnoy's direction to him when planning the memorial service was,"Yo, make it something I'd like to be at." There's no question that Brudnoy ("whose favorite topic was David Brudnoy," as one speaker said) would have laughed and cried along with the crowd at the Majestic, especially as his longtime partner Ward Cromer closed out the afternoon with his stories of life and travel with Bruds. One of Brudnoy's few unfulfilled wishes in a life he lived with incredible fullness was to visit India and the Taj Mahal, a wish Cromer said he'll fulfill later this year when he travels there to sprinkle some of David's ashes at the site. And in thanking those who mattered most to David, it's worth noting that Cromer singled out the callers, the "vox populi" who carried on a dialogue that lasted for decades. Cromer spoke movingly of Brudnoy's final show on WBZ the night before his death, when Meade took calls from listeners while Brudnoy listened intently from his hospital bed at Mass General. Of one such call, from a listener named Keri who credited David for getting her started in radio (and that would be NERW reader Keri Rodrigues of WHJJ in Providence), Cromer said "callers such as Keri meant the world to David." David, in turn, meant the world to so many of us, who miss his voice every night on the radio and the joy of his presence, and you'll forgive your editor for the personal aside, I hope, in saying just how much it meant to be in the company of so many of those who loved David Brudnoy. There's some good news out of WBZ to report: Paul Sullivan, heir to Brudnoy's evening hours, is recovering from his treatment for a brain tumor. Sully was greeted with hearty applause when he stepped on stage at the Brudnoy memorial, and he confirms that he'll be back in his 8-midnight slot Monday night, followed by the return of Steve LeVeille to his usual overnight slot after months of filling in in the evenings. With that, WBZ will finally have a "normal" nighttime talk schedule for the first time since Brudnoy's death, and we're sure PD Peter Casey (who deserves tremendous appreciation for the work he put into planning Sunday's memorial) is breathing a sigh of relief. And with that we come to PENNSYLVANIA and the week's other top story. It was no secret that WPLY (100.3 Media) was losing the Preston and Steve morning show at the end of February; after sitting out a six-month noncompete, the pair will reappear this fall on Greater Media's WMMR (93.3 Philadelphia). But it was something of a surprise even to Y100's staffers when the end of the Preston & Steve show Thursday morning was followed just hours later by the complete demise of the station's modern rock format. The duo's final Y100 show was peppered with clues about the impending end, including their last song, "Alive" by Pearl Jam, which was the last song played on the old WDRE (103.9 Jenkintown) before it dropped modern rock in 1997. Here's how the deal shakes out: Souhan will sell the stations to Family Life Ministries of Bath, which operates an extensive noncomm network of religious FMs across upstate New York and northern Pennsylvania. Family Life will then trade WSFW AM/FM to George Kimble's Radio Group for Kimble's WLLW (93.7 Clyde), which serves the eastern Finger Lakes from studios in Auburn. From a programming standpoint, WLLW's rock format and calls will move from 93.7 to 99.3, Family Life will take 93.7 religious under new calls, and WSFW(AM) will switch from satellite classic country to satellite adult standards (the same format Kimble now runs on WAUB 1590 in Auburn).